SUMMARY: In the 20th century, Jimmy Hoffa was a man obsessed with power. The mob wanted him dead, and on July 30, 1975, they hired his friend to do it. But Hoffa was never murdered that night…and the mob didn’t know about time travel. Every four and five years, invisible doorways open and close. Any living being caught within the magnetic, gravitational field awakens incoherently to a future world. On July 31, 1975, it happened to Jimmy Hoffa, and he awoke in the summer of 2010. Before he could ever learn the truth of what happened that night, he was imprisoned in a facility, guarded by a team of agents. Would he ever escape to see his kids, grown and years older than he? Or would he forever remain at the will of another, stripped of all sense of a word that he once knew so well? 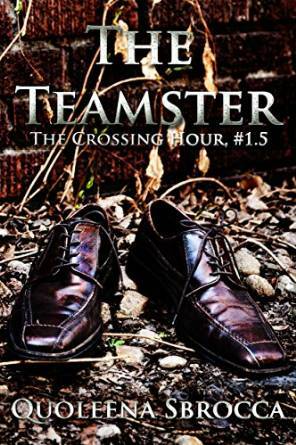 THE BACK STORY: The Teamster was originally intended to be a short story, but it grew to become 15 chapters and nearing 300 pages. It is a segue of sorts to book 2, coming 2016. WHY THIS TITLE? : This book takes off where the first book ended. I say “take off” as opposed to “pick up.” To say more would be too much of a spoiler. WHY WOULD SOMEONE WANT TO READ IT: This book resolves the mystery behind Jimmy Hoffa’s disappearance. Is time travel real? Jimmy Hoffa now believes it is. AUTHOR PROFILE: My name is Quoleena Sbrocca. (If you try to pronounce it too fast, you’ll likely get a brain freeze. Kwo-LEE-nuh Su-BROH-kuh). I’m a Denver native. I went to San Diego State University as a dance major then earned an MFA in Photography from The Academy of Art University. If you’re interested in checking out my photography, you can visit my website: http://www.sbroccaphotography.com I’ve always loved creative writing. I realized I wanted to write a book during my senior year in college. It only took 14 years for me to try. Truth is, I never had an idea for one until August 2014. Before I even completed that first draft, I “knew” I only had one story to tell. Then that story became a series, and now I can’t stop writing. The ideas just keep coming. The obsession is real.